This DVD was recorded in October 2015 at the 2. European World Ayurveda Congress in Koblenz. This will include simple solutions of healing common ailments through plants which are mostly used as food and spices in Ayurvedic cuisine. 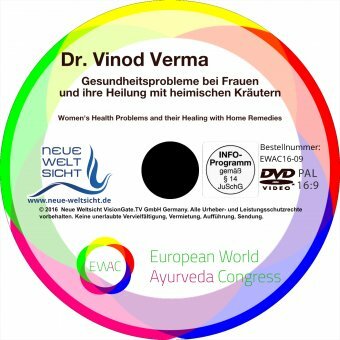 Dr. Vinod Verma is a pharmacologist, neurobiologist and ayurvedic doctor.After a PhD in Reproductive Biology in India she studied neurobiology in Paris and received his doctorate there a second time. She then worked at the National Institute of Health in Bethesda (USA) and the Max Planck Institute in Freiberg. At the height of her career in a pharmaceutical company in Germany, she gave up everything and studied ayurvedic medicine. She became aware that Western medicine understanding always treated subregions. She turned to Ayurvedic medicine, which her family has a long tradition – her grandmother was a renowned healer. In the last twenty years Vinod Verma Ayurveda studied in the tradition of Guru-Shishya at the Banaras Hindu University. She brought the first salvation knowledge of Ayurveda as a scientific discipline in the West. Her numerous books are fundamental works of Ayurveda and were translated into many languages. She leads two Ayurvedic Institute in India and regularly gives courses and seminars in Germany, Austria and Switzerland.